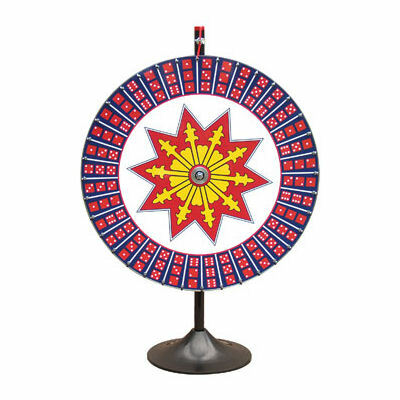 The symbols on the wheel represent some of the 216 possible combinations of three dice. Some of the same symbols appear in more than one segment. Players wager on the numbers 1 through 6. If the number appears on one of the dice in the winning segment, the dealer pays at 1 to 1. If the number appears on two of the dice, the dealer pays at 2 to 1. If the number appears on three of the dice, the dealer pays at 3 to 1. Our casino games are for novelty entertainment and décor only. These items may only be used in the manner currently allowed by the state as well as the county, site and municipality in which they will be used by the renter. Renters are responsible for acquiring and obeying all current state, county, site and municipality laws regarding the use of any casino items.